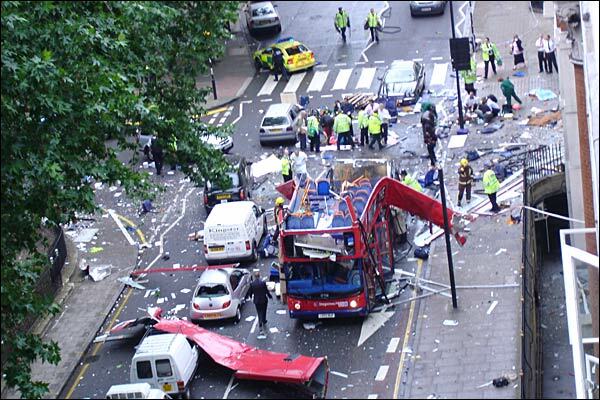 Four suicide bombers struck in central London on Thursday, 7th July 2005, killing 52 people and injuring more than 770. The co-ordinated attacks hit the transport system as the morning rush hour drew to a close. Three bombs went off at or around 0850 BST on underground trains just outsideLiverpool Street and Edgware Road stations, and on another travelling between King’s Cross and Russell Square. The final explosion was around an hour later on a double-decker bus in Tavistock Square, not far from King’s Cross. The 7th July bombings were the first suicide attacks on British soil and were carried out by home-grown terrorists. Four attempted bombings took place exactly two weeks after the deadly 7th July blasts. Once again, they were spread out around London and once again there were three on underground trains and one on a bus. Only the detonators exploded in the devices. The main charges, made from hydrogen peroxide, flour and other chemicals, failed to detonate. The failed devices were found on trains at Oval and Warren Street stations and on a bus in Hackney. Another device was found on the Hammersmith and City line not far away at Shepherd’s Bush. And a device was found in a rucksack abandoned in bushes at Little Wormwood Scrubs two days after the failed attacks.